"Craving that carnival food? 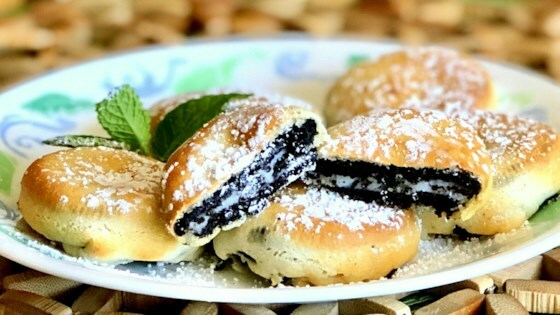 With just 3 ingredients and an air fryer, you can make fried Oreos® at home!" Mix pancake mix and water until well combined. Line an air fryer basket with parchment paper. Spray parchment paper with nonstick cooking spray. Dip each cookie into the pancake mixture and place in the basket. Make sure they are not touching; cook in batches if necessary. Preheat the air fryer to 400 degrees F (200 degrees C). Add basket and cook for 4 to 5 minutes; flip and cook until golden brown, 2 to 3 minutes more. Sprinkle with confectioners' sugar. Creamy banana goodness with crunch! A little bit of heaven in your mouth! Can’t eat just one!